As promised, here’s a blow-by-blow of Archie and Edith’s adventures in procreation. 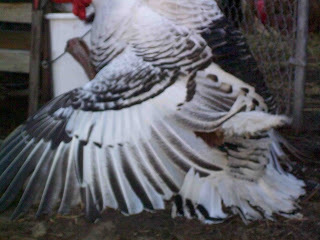 First off, Archie is constantly preening and puffed up. He seems to be in a permanent state of arousal. When he sees Edith, when a chicken walks by, when I go outside to feed them, when the goats pass by him, and yes, even when he sees the rabbit. Hell, a sparrow could fly by and he’d puff up. It’s really Edith who decides when to do the nasty. She will squat down, sort of like a chicken, but laying with her breast on the ground. Then Archie does some puffing and huffing (literally, he makes this airy gulping noise) and circles around her. Then he stands on her wings. It looks kind of painful, this big puffed up bird trying to balance on her delicate wings. You know how they say factory farmed turkeys can’t ‘do it’? It totally makes sense to me now. Because it’s a balancing act really. And it requires space and time. Ok, then Archie pecks Edith’s head for awhile. Love pecks, I guess. Then he manuevers around and gets her tail up. He looks pretty funny doing this part. Like a nasty humper. He drapes his wings along her side, and Edith makes some cute chirping noises. 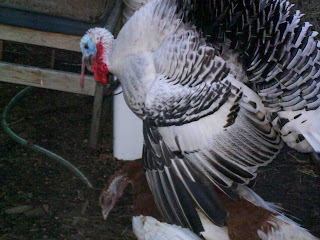 Interesting fact that turkeys and chickens don’t have proper penii, they just rub their duct onto the female’s oviduct. 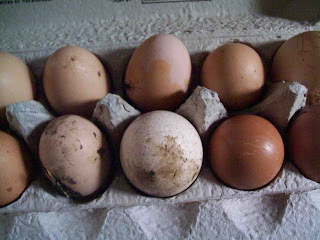 Edith’s eggs look similar to a chicken egg, but larger and with a more rounded bottom–can you tell which one is hers? While I was in New York Bill reported that she had started to set on a clutch of eggs. But then she got bored and hopped off. I’m hoping spring will make her broody and soon we’ll have little poults marching around. I think Edith is going to be a good mama. 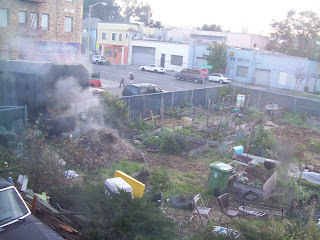 I returned home from a quick trip to New York to a boggy soggy Oakland garden. So when the Ponderosa Tree Company called last night and asked if I wanted a free 5 cubic yard load of mulch, I agreed, though I have a million other things to do. 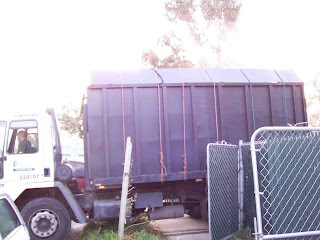 This morning the truck showed up, backed in between the gates, and dropped the load. Mulch is defined as any organic substance that keeps weeds down and eventually breaks down into soil. It can be straw, wood chips, nut shells, coffee grounds. This stuff is California bay laurel and pine. It smells amazing, kind of what I hope a native American sweat lodge smells like. Note that the pile is steaming because it’s decomposing! The only hitch is, the guy couldn’t back the truck all the way into the lot so about half of the load is um, on the sidewalk and the street. Sorry neighbors!! So really what you are looking at is my personal mulch trainer–I’m going to get buff moving this wonderous substance. Why I am telling you about this? I really needed a break. 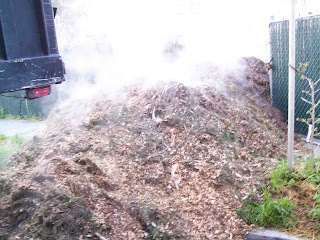 Ok, ok, back to the mulch pile…. My trees look like trauma victims. They’re hacked up, taped together. They’re part of my dastardly grafting scheme. A few weeks—maybe even a month ago—I went to the scion exchange held by the California Rare Fruit Growers Association . Fruit geeks. My people! I knew I was in heaven when I overheard two fruit lovers comparing sapote tasting notes. I know a little about fruit, but nothing what these people know. Which kind of pear tastes the best (Buerre Blanc), which mulberry scions–pieces of branch that can be grafted onto a tree–to get (“Alba”), how to cleft graft a Green Gage plum. I took about 25 scions home, stuck them in the fridge and promptly forgot about them. But now I’m going on a quick trip to the East Coast, I have a million things to do and so I spent today grafting. Onto the Persian Mulberry, onto the persimmon, onto the plum, onto the Granny Smith apple tree which hasn’t burst yet. 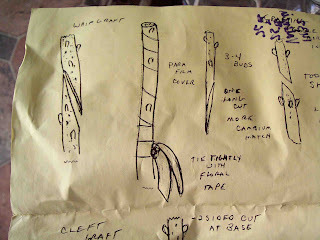 The idea is to match up the cambium layers of the little twiggies with some judicious cuts. Then you wrap them tightly together with parafin. The idea is the tree, in a burst of springtime good will, will think the little scion is an injured part of itself. It’ll send forth energy and heal the wound, thus bringing the two branches together. 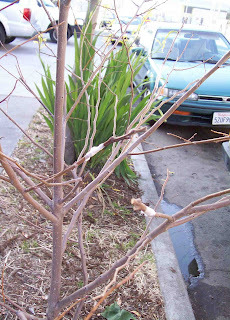 The graft looks like a pucker on the branch once it has healed. I’ve successfully grafted an Orange Pippin onto my apple tree before, but no word on the fruit yet, it can take up to three years before you get fruit. Still, there’s something satisfying about fooling the tree. I’m just hoping ONE of these takes. P.S. View from my desk. What do ducks dream of? Yesterday I looked out on the deck and saw the duck having a dream. His bill was tucked into his wing, his eyes were closed, he was fast asleep but he was shaking his tail, his wing tips quivered. I watched him for a few minutes, trying to figure out if it was a good dream. Or was it a re-enactment of the dog attack that left him the sole survivor of his flock? It was hard to tell. I went into the duck’s mind, and figured he might be dreaming of swimming, something he only got to do for a few months before the dog attack. His orange foot kicked a little. 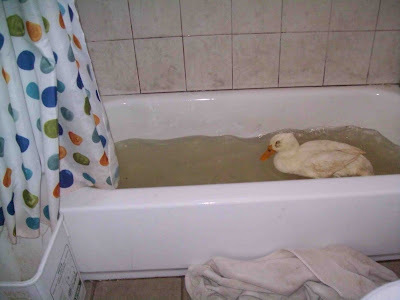 Later I saw that Bill took a bath and left the water in the tub, which we do so we can use the water to flush the toilet. So I got ducky and stuck him in the water, then sat down to watch him. At first he quacked and quacked, and I thought I should get him out, but then he bobbed his head under, tasted some water, and paddled around. I’ve never seen him so happy. He took a long bath, flapped his wings, got his feathers clean. 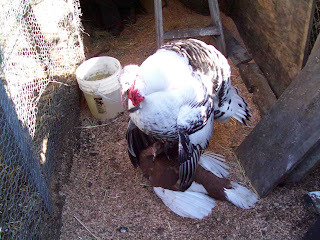 Then I carried him back out to the deck, where he lives with the rabbits and an occasional baby chicken. I thought one day he would recover and perhaps I’d sneak him down to Lake Merritt to live out the rest of his days in a bird wildlife refuge. Thing is, he never really got better. Now when I look at Sir Duckerton I just feel sorry for him. His gimpy leg, his dreams. 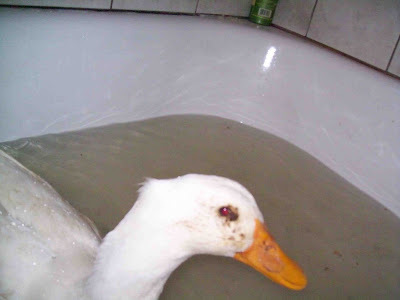 I mean, is this the proper life for a duck? Or is this a metaphor for life on this earth–a few joys, sadness, and dreams that seem so real. When I was little, I told my mom I was going to be a cowgirl on a dog ranch. I liked dogs, but I loved cowboy boots….My first existential crisis arrived when I was told I couldn’t have a pony in downtown Shelton, WA. 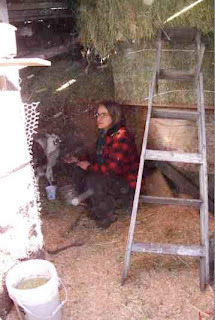 I remember standing at my bedroom window, cursing my pony-lessness, looking out into the maze of walnut tree branches, and I knew it for the first time: I was alone in this world…The smell of alfalfa, is intoxicating to me, if I could make a perfume, it would contain that citrus grass smell that I love so much….This year I decided I’m going to move slowly, take my time, chew on the end of a piece of grass, ask everyone how they are doing before I launch into what I need from them…Somehow this all relates to the goats. They’ve changed my life. Suddenly, I have occasion to buy alfalfa. I went to Alamo Feed and Grain and got two bales of a mix of alfalfa and grass. The clerk, a man with an amazing waxed moustache (he was about 25 years old) and I chatted a spell before I bought my items. My car reeks of the stuff now. 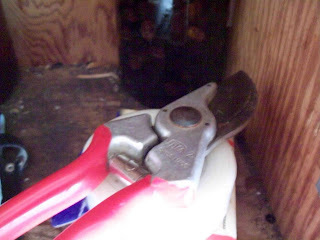 Once home, I unloaded the bales and realized I need a pair of hay hooks. That’s just my reality. 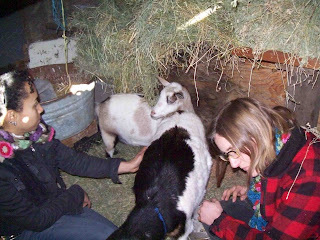 The goats love the grass and alfalfa, they chewed thoughtfully while I crammed the bales into the “hay loft.” Then I sat in the sawdust with Bilbo and Bebe and read the newspaper (Bilbo tried to eat it), and drank some coffee. The turkeys strutted over to investigate. A chicken came, laid an egg, then headed out again. A bunny on the loose came out of nowhere, installed himself in a sunny corner, and fell asleep, ears flat against his body. Alfalfa from the hay rack fell onto my hair made me sneeze a little, drifted into my cowboy boots that didn’t seem quite so ridiculous in downtown Oakland anymore. Everything was so calm and peaceful. Bebe made a little bah-bah noise to me. 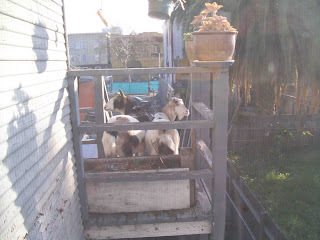 I don’t speak goat, but I assumed it was a request for some sunflower seeds, which I dug up from the shed. Bilbo came over for a scratching, like a dog. Bunny, chicken, turkey, goat, human. Was this the dog ranch I had pined for so long ago? The goats are here! The goats are here! 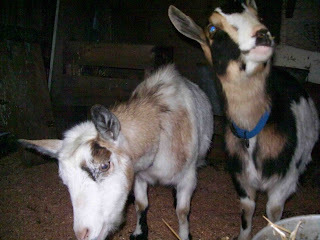 I spent all day yesterday in Lake and Mendocino county picking up and learning about Bebe (left) and Bilbo (right). 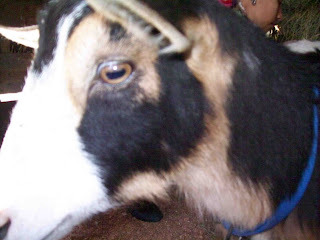 They are Nigerian Dwarf goats and stand 23 inches from the shoulder. Both of them fit in the back of the station wagon with no problem. I went to Ukiah and got all their diet needs (and a cowgirl shirt for moi) at a groovy farm store. Bebe is pregnant, and will be kidding in a month. Bilbo is her wether buddy, so Bebe will transition better into our new place. She’s very shy, but so cute with her pale blond face. The chickens seem to be looking at the goats and thinking, now that’s a big chicken.